The Italian BIP project (Biglietto Integrato Piemonte) is one of the first implementations that uses the new NeTEx format. The Porject has been co-funded by Piedmont Region (Italian Local Administration) and technical coordinated by 5T s.r.l. ; it represents an innovative integrated ticketing system for Public Transport Operators (PTO), railways and for virtually all other transport systems. Main goals of the project is to enable different PTO’s, interoperability adopting a unique electronic contactless ticketing system, based on Calypso technology based Smartcards, Automatic Vehicle Monitoring system (AVM) enabling real-time and off-line monitoring of executed service and a video-surveillance system for passenger safety. A Regional Service Centre (called “CSR-BIP”) has been created for the governance of the whole System, with the role of an independent judge able to solve issues between different operators. The BIP Project Architecture has been designed as a “universe ” of stakeholders interacting with each other in order to allow their users to access transport with a single Smartcard. 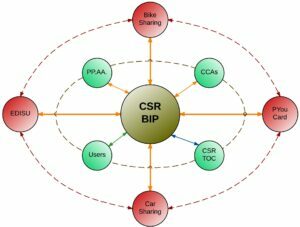 Data exchange among Service Providers, Public Administrations and CSR-BIP is made using a tailored version of NeTEx communication Exchange Protocol (called BIPEx). The BIP Project involves over 100 Public Transport Operators (PTO), nearly 3.400 vehicles, more than 8.600 stopping points, nearly 400 train stations, from 1 to 4 million people with a total investment of 50 million euros.